Luton interim boss Mick Harford hailed his side’s first half display during the 3-2 win over Portsmouth last night as the best performance he'd seen in League One during his whole career. The Hatters were quite simply magnificent in extremely tricky conditions at Kenilworth Road, with snow falling throughout the 90 minutes, as they passed their opponents off the pitch at times. Despite their dominance though, they could only manage one goal, James Collins’ 15th of the season, which led to a thrilling second half, Town pegged back to 2-2, eventually coming out on top thanks to George Moncur’s late free kick. Harford said: “I’m very happy indeed, as you can see at the end with the celebrations we had with the players and the fans. “I’ve got to take my hat off to the players, they’ve been absolutely brilliant since I took over the interim role and you saw in the first half, what a performance, a performance at that level which I’ve never seen in my entire career. “They were absolutely superb in the first half and the game should have been out of sight in all fairness. "But fair credit to Portsmouth, they hung in well, defended well, defended their box well, they got everything behind the ball and we couldn’t break them down for the second or the third goal. "They’ve come out second half and given us a real good game, and for me it just really, really showed the character amongst the boys here. 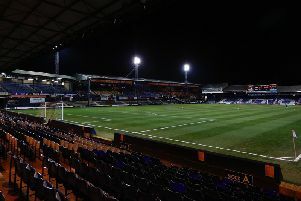 On a difficult playing surface, with the snow settling from before kick-off, Luton didn't let it affect them, completely dominating the opening period. It was a different story for the second 45 with Pompey introducing recent signing Omar Bogle, the Cardiff loanee a real threat, as Dion Donohue restored parity just five minutes in. Collins' second from the penalty spot looked to have given Town breathing space with 13 minutes to go, only for Bogle to then level moments later. However Moncur won it with a wonderful set-piece, as Harford felt it was justified result. He added: “On a tricky pitch, on a strange evening when it was snowing, it wasn’t easy to play that style of football, but they just got on with it. “They adapted, found themselves spaces, got into great positions and it could have been any scoreline and the opposition wouldn’t have been against that in terms of how we played and what we did. “But 1-0 at half time, we didn’t really start the second half very well, sat a bit deep, a few gaps and they exploited it, fair play to them. “They got back in the game and I think Sheasy (James Shea) made a great save, at one each, unbelievable save and we went on. "It was a pulsating second half in terms of they were on top early on in the half, then we got back into the game, we changed shape, went 4-3-3, and got Kaz (LuaLua) on to that side of the pitch and he got us a penalty. "I’m absolutely thrilled for George, he’s come in and scored the winning goal, his first goal for Luton.